Central Lancashire New Years Half Marathon on the 7th January 2018. The training is well underway so show them your support: Choose who you want to sponsor – it’s all a part of the competition!!! 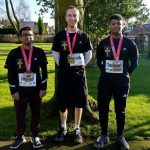 Metanoia Madness Half Marathon Completed (2/25/2018) - Joe, James, Jonathan and Tushar completed their half-marathon Metanoia Madness challenge without breaking a sweat (well not much of one anyway…) We are so proud of their energy and enthusiasm and are so grateful for the money raised which will help in our evangelising efforts and with our plans for growth in the Project.